There have been plenty of teen books released over the years that deal with health issues such as cancer and anorexia. In recent years, as the condition has become more commonly diagnosed, there has also been a surge in the amount of books that focus on characters with autism or Asperger’s Syndrome. All of these illnesses/ conditions are difficult for the sufferer and those around them, and many authors have taken on the challenge of educating their audience about the hardships that can be endured by those unlucky enough to face the ailment. But despite the varied maladies that are suffered by book characters, few authors have dared to traverse the expletive-laden minefield that is Tourette’s Syndrome- until Brian Conaghan. In his novel, When Mr Dog Bites, our young protagonist Dylan Mint is sixteen-years-old and struggling to live a normal life. He constantly has to fight Mr Dog (his personal nickname for the growling, howling dog in his body), that makes him release bad words and nervous tics whenever he gets stressed out or nervous. He and his best friend Amir (who has autism) attend Drumhill School, a school that caters to the ‘special’ kids in his region. Even though every teen there has some sort of disability, there is still a popularity hierarchy, and this is determined by how serious your disability is, how crazy you are, or how much medication you take. As a result, Dylan and Amir find themselves victims of bullying by their peers, even though they would all be classified as ‘special’ (or worse) by other kids in the ‘real world’. Don’t expect this book to be full of pleasantries and censored, just because it is aimed at young people- the F-Word and C-Bomb (as well as plenty of other four-letter expletives) are used indiscriminately, and only serve to highlight the callousness of Tourette’s syndrome for its sufferers. 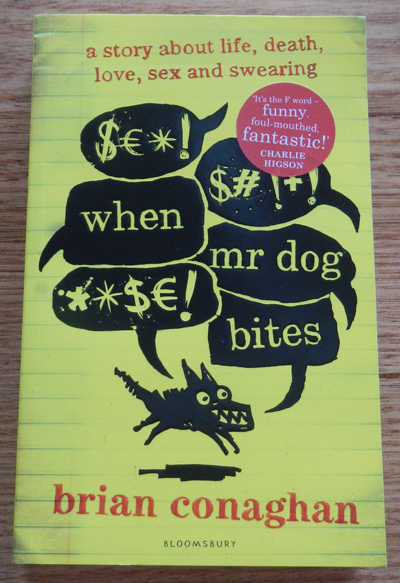 While this language may be a deterrence for some readers, When Mr Dog Bites is nevertheless a charming story about younger people who, despite their differences, are just as shaped by the world around them as their ‘healthy’ counterparts. The kids at Drumhill School are influenced by television and popular culture, just as the kids at the normal schools are, and while they may have to deal with cruelty from several facets of life, they still do their best to remain positive. This book may not appeal to everyone, but there is still something to be learnt from the difficulties faced by Dylan Mint.